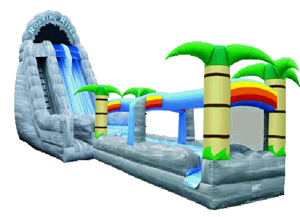 This eye-catching waterslide is a customer favorite that is sure to not disappoint! This is for the ultimate thrill seeker. The two in one vertical and slip-n-slide is the perfect combination for fun. The Roaring Rapids is a 22ft. 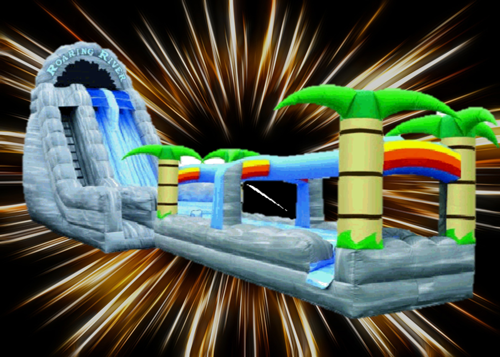 tall Tropical themed water slide that has two lanes for racing and goes into a slip-n-slide and splashdown landing! You will fly down this slide with it's completely vertical lanes, race into the slip n slide landing, then splash into the pool. The multi-colored theme makes it a great fit for any party. Adults and teens love this slide. All ages are welcome to slide, but is best suited for ages 7 to adult. This water slide is an 18' wide X 73' long water slide. This requires a fairly large area for set-up, so be sure to mark it off to know it will fit where you want it. With the the top being 22' tall, any low hanging trees need to be trimmed for set up. The Roaring Rapids is inspected and approved by the state of Texas for safety. The wall at the end stops your momentum so the racing stays fun and free of harm! You truly will not believe the looks of this when it is set up. it is much bigger in person than expected. If you want the Roaring Rapids at your party, don't wait, as these book quick during the hot summer months. In order to book the Roaring Rapids water slide, simply click start reservation above or the add to cart option. Don't forget to check out the other options we have to add to and complete your party! There are cotton candy and snow cone machines, tables and chairs, and tents to help forget that pesky sun. Once you have added everything you need for your party, enter all of your party information and a $50 deposit to hold the rental. An immediate email confirmation will be sent for your order. If you would rather book over the phone or have any other questions, feel free to call us. We would love to assist you in the best way possible.